Instant Pot Ham Hock and Bean Soup is a hearty classic you can make in your pressure cooker. Great flavor from a smoky ham hock, thyme, garlic, and bay leaves. You don’t even have to soak the beans if you don’t want to! 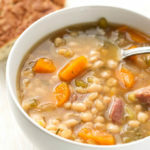 This pressure cooker ham hock and beans soup recipe is adapted from my mom’s. I know there’s a month of Summer left, but I’m ready for all of the comfort foods of Fall! Pumpkin everything is already circulating online, so others must be feeling it too. So starts my Instant Pot Soup recipes posts! 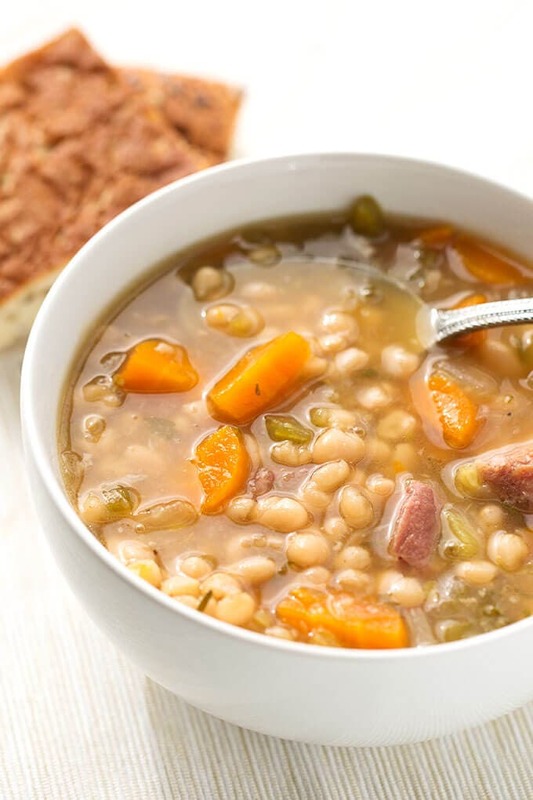 Once again, I’m turning to my trusty Instant Pot to make this Instant Pot Ham Hock and Bean Soup. No need to have a pot boiling on the stove for a few hours, and I didn’t start it early enough to use my crock pot. In the electric pressure cooker this soup only takes about an hour. That includes the warm up and natural release time. Not bad! Just keep in mind that old beans will take longer to cook. It is almost impossible to tell how old beans are, so just cook the recipe per instructions, leaving yourself a 15 to 25 minute window of time in case you need to add more time. Also, on a warm day, I’m not heating up my kitchen. I say that all the time, but it is a huge reason why I will choose to make something like this in the Summer! This pressure cooker ham hock and beans soup is total comfort food, and sure brings back my childhood! Instant Pot Ham Hock and Bean Soup can be ready in a little over an hour. 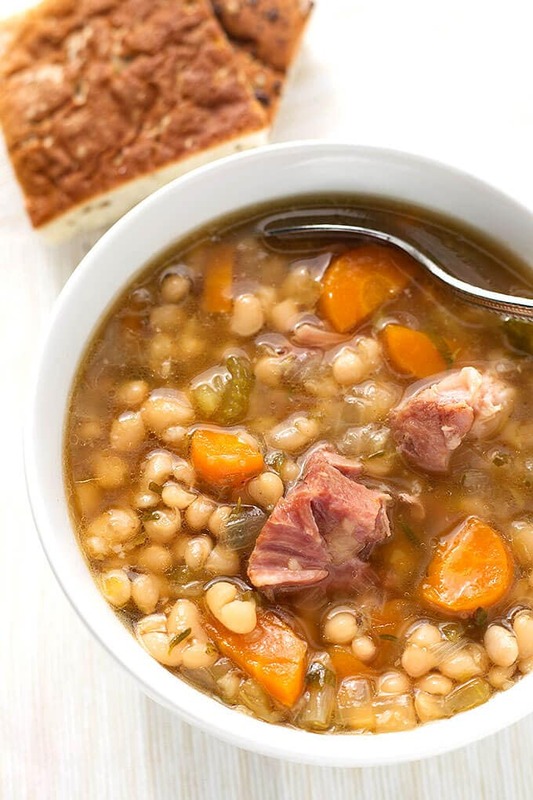 Cook a tasty ham hock with navy beans and veggies for a delicious and comforting soup. Add all ingredients to the inner liner of the Instant Pot. Stir (Make sure the beans are fully submerged so you don't get any crunchy ones). Put the lid on, and set the steam release knob to the Sealing position. Press the Pressure Cook or Manual button or dial, then the +/- button or dial to choose 45 minutes. When the cooking cycle ends, turn off the pot and let it naturally release pressure for 20 minutes. Carefully release the remaining steam manually, using short bursts at first to make sure the soup won't spew out of the steam release knob. When all steam is out of the pot, and the pin in the lid drops, open the lid facing it away from you. Serve hot with some nice bread or rolls. *I soak my beans for 2 hours and use 35 minutes for this recipe. If you don't soak your beans, try 45 minutes and add more time if you need to. Omg – this was absolutely delicious!!!! Thank you, Kathy! I’m so happy that you liked it! Thank you for taking the time to leave a review! Use the Pressure Cook button and then the +/- button and select 30 minutes, since the beans are soaked. can you just use canned kidney beans? You can, but you will need to cook the ham hock first, then add the beans and cook for about 5 minutes since they are already cooked. One of my all-time favorites! I don’t have an IP, but I suppose I could make it in a regular pot. Always appreciate a new recipe! Thanks! Yes, I would soak the beans first so it won’t have to cook so long. Let simmer for about 90minutes. You could also soak and throw it all in your crock pot if you have one. Let it cook on low all day! Hi Jill, yes it does. I have to freeze many of my soups as it’s often just Paul and me. Once you thaw them cooked beans are much like canned beans, so heat them in the IP on the steam setting for 5 minutes to start, in a dish (I use a stainless bowl, on a rack, water in the pot below it) or on the stove at a low temperature. Did you soak the beans in the I.P.? If so, could you give complete instructions? I have a new I.P. but have not used it yet…a bit scared to! Hi Carol You don’t have to soak them. For this blog post I soaked the beans for 2 hours, and I cooked the beans for 35 minutes. If I don’t soak them I cook them for 40 minutes. If you happen to soak overnight, you can cook for 20 minutes, but I don’t recommend that if using a ham hock. The meat needs the time to become fall off the bone tender. You can do it! If you haven’t done the water test yet, do that to get familiar with your IP. Then make something simple like eggs. You will be an expert in no time! Sandy, thank you for this recipe! I finally got to use my I.P. for the first time! Made this, using black beans as I had no Navy Beans. I used fresh thyme, but dried parsley, adding in a few chunks of ginger to help reduce gassing. (not sure if you meant ONE 1/2 # Ham Hock, or 1 and 1/2 # ham hock, but I just put in 1.5 # ). From start to finish, it took exactly 2 hours & 45 minutes. That includes soaking the beans for ONE hour, chopping the veggies, preheating, cooking and natural steam release then manually releasing. This was fun, and as I’m right now eating the soup, which is delicious, a huge success! I will be using this a lot; I often plan a meal, but forget that it takes awhile to cook, and I get home relatively late so this will mean that I can eat good home cooked food a lot more. A great way to break in my new kitchen toy! Carol, that’s great! I better go look at that recipe and make sure I am clear on the amount. It is 1.5lbs of ham hock, so you did it right! I’m glad you were able to make this with your substitutions. Thank you very much for the nice comment and feedback! Great recipe. First time to make this in my IP. I USED 3 CUPS PREsoaked pinto beans and 1 smoked ham hock. LOVE the flavor. Hi Lydia, I’m glad that you liked this soup! Thank you for the nice review! What kind of stock do you use when you say stock or water? Hi Krista, chicken or stock made from ham/pork bones tastes best. I have great northern beans I smoked over night and ham hocks.. do you think I could put all in but beans cook for 20 minutes.. quick release then add the beans and cooks for 20 more? Or would that be a disaster? Hi Michelle, did you mean soaked the beans? If so, yes, if you want to take the time to do that, the ham hock will get bore cook time, and end up releasing more flavor and will be more tender. If you are lucky, there will be some tasty meat to toss into the beans. I have found that soaked beans can handle 25 minutes. I tend to like mine a little softer. Hi Sandy, Would substituting pinto beans for the navy beans be okay? I just realized I only have dry pinto beans and red beans. Hi Viki! Yes, pintos are great with the ham hocks! A little different flavor, but still delicious! Made this tonight. It was delicious! Everyone raved about it, will make it again. Quick and super easy. I boiled the beans for 1 minute, covered them for an hour and they were good to go. Hi Linda, I’m glad you all enjoyed the soup! Such a classic. I appreciate you taking the time to write a review! Turned out really good. I used a ham bone, Hurst’s 15 bean soup dry beans (not soaked). Included the season packet from beans (because I know it’s good), garlic, salt & pepper instead of other spices. Also added 1 quart of home canned tomato juice similar to V8 along with the chicken broth. Cooked in IP for 40 min, NPR for 30. Turned out perfect! 1. I had a cooked ham bone, and soaked beans. The texture was a bit mushy for my bunch…would I just cook for 5 minutes less? 2. After 35 minutes, you said turn it off. I did, then ran to get my boy from school. When I came home, I expected the pressure valve to be down. It was not, so I did the manual release and it took forever! When all the steam was gone, I opened it up and it was boiling!!!! WOW….Why didn’t it release naturally??? Hi Amy, so happy you liked this recipe! To answer your questions: 1) 35 minutes is when you have only soaked the beans about 2 hours. If that was the case, and that is how long you soaked them, then either don’t soak them next time and try the same time, or cook them about 5 or 10 minutes less. 2) After the cook time ends, set a timer to keep track of the natural release time. You want to let it sit undisturbed for 20 to 30 minutes. It will be naturally releasing during this time. It will not fully release all of the pressure in that amount of time, and that is why you need to turn the knob to release the remaining pressure. The amount still left in the pot will depend on how full, and how much liquid is in the pot. Reason being, that amount of liquid equals more steam. If you make something like boiled eggs, with only 1 cup of water in the bottom, the pressure will drop very quickly in comparison. Hope that helps! So I want to try this…do you use fresh pork hocks or precooked smoked ones?? Hi Kecia, I prefer the smoked ham hocks for that flavor! Sorry for jumping in late to this–HAM hock, not pork hocks. Yes, smoked ham hocks are better than plain ham hocks. Do not use pork hocks–they are uncured (Ham being cured pork). I made the mistake once of trying pork hocks in soup instead of ham–pitched the whole works. Edible, yes; tasty, no. BTW–cooking this recipe as we speak. Will this recipe fit in the 3 qt IP? No, I would reduce it a bit to make it fit. My beans are dated best by Oct. 2018 but it took an hour of pressure cooking to get them to my preferred softness. Otherwise I really enjoyed them. The ham hock enjoyed that extra cooking time too. Hi Terry, you just never know with beans. I like to allow for extra time, just in case! And yes, those ham hocks are better the longer they cook! Thank you for your review! This recipe is absolutely delicious! I used Great Northern beans. Soaked for 2 hrs and cooked for 1 hour, they weren’t nearly done. I cooked an additional hour and they were perfect. Hi Connie! It’s hard to make this recipe with consistency as beans vary so much. Old beans take longer to cook, and some varieties take longer than others. My best advice is to always allow yourself a little time cushion when cooking beans, in case you need to add some time, as you did. I’m glad you enjoyed the recipe! Thank you for the feedback! Can I use the soup button instead of bean/stew? Yes, as long as it is set to High Pressure. You could also use the Pressure Cook/Manual button. I made this with dried great northern beans, no soaking. The ones on the top (not completely submerged) were a smidge undercooked after 40 minutes. If I do it again, I’d make sure the beans went in first so that they were 100% submerged to ensure they all cook the same. Great recipe though! Really flavorful and good! Hi Ben, Yes, just like cooking dry pasta, you want the beans submerged. Thank you for the feedback, and the review! I’m glad you enjoyed this recipe! how can I use regular pressure cooker for your recipes…I do not own a instanpot. Hi Vicki, stove top pressure cookers cook faster, so I would try a recipe that has fewer ingredients and cook it for 10% less time and see how it comes out (to get a reference point). Stove top pressure cookers take longer to come down in pressure, so that’s something to factor in. Also, there are many resources for converting stove top to electric, so you could find one and just do it opposite. Made this as stated using a leftover ham bone. Except used dried basil instead of thyme (didn’t have on hand). Changed cooking time. Did a quick soak with the beans. Bring water to boil with beans, turn off on let sit for an hour. Reduced cooking time to 8 mins. Turned out wonderful. Great flavor! Hi Charlie, that’s a great way to speed up the cook time. I’, glad you liked it, and thank you so much for your review! How can I do this with canned Great Northern Beans, in my ip? I only have half a bag of dried. Boooooo! Hi Tina, because the ham hock needs that time to cook, I would add the canned beans after pressure cooking, then add the beans, put the lid back on and set for 3 minutes and that will cook the canned beans. Great recipe! I added a red & green bell pepper & the flavor was amazing!! Hi Denise! I’m so glad you liked this recipe. Green bell pepper is good in so many recipes. I wouldn’t have thought to add it to this one. Thanks for the tip! Thank you for your review! Made this with a leftover ham bone from easter. Did as written, except no Bay leaf or parsley when served. Had it with some cheddar cheese and a French baguette. Totally awesome. Might try serving with some crushed red pepper flakes, or throw a jalapeño pepper when cooking. Hi Tom! I’m happy that you liked this soup! The cheese and French baguette sound like perfect accompaniments to this! Thank you for your review! Hi Sandy! This recipe is really close to the one I’ve been using for years. We use pinto beans, as they have such a creamy texture. We also have to get smoked ham shanks from a specialty butcher, as the hocks sold at our local grocery store have almost no meat on them. One other thing that my mother taught me was to “de-gas” the beans: covering them well with water, stirring in a couple tablespoons of baking soda, and soaking them overnight. I’m unsure if this really does anything, but I do know that we never have any “musical” problems after eating this delicious recipe. We also saute the onions in olive oil for about 3 mins, then add the garlic and saute for another minute, then stir in the carrots and celery for another minute. This, along with the overnight soaking, makes the cook time an exact 25 minutes. HI Mark. I’m also not sure about the baking soda trick, though only certain beans make me “musical.” Thank you for the comment! just made this recipe added chopped celery carrots onion and cubed ham. Flavor was fabulous! Sounds great, Ed! I’m glad you liked it! Thank you for your review! My IP has the buttons soup/stew or beans/lentils. But the recipe calls for beans/stew button. Which one should I use or shouldn’t it matter? What’s the difference between the 2? Hi Heather, the only difference is that the button has a preset time. They are both High Pressure. You could use the Pressure Cook or Manual button as well, and then the +/- button to adjust the time in minutes. Can I use frozen ham hocks? Oh. My. Goodness!!! So simple and so delicious. It reminded me of my mom’s navy bean soup, but so much faster! My navy beans were a little overdone, so next time I will cut down the natural release time (from 40 min to 20). The flavor from the smoked ham hocks is devine! This recipe is a keeper!! Thank you! Hi Susie! I’m so happy that you liked this soup! Looks like we both had moms who could make a great bean soup! Thanks for your review! This is a perfect recipe except I used pinto beans, not navy beans. i find them to have more flavor, are very healthy and more texture. I did everything else as specified and it turned out perfect. Thanks. Will make again. Awesome! I’m glad it worked for you! Thanks for your review! I am wondering what size instant pot you used. I have a 4 quart…would that work? Hi Pam, I use a 6 qt. I think this will fit in a 4 qt. Maybe hold back 1 cup of the liquid until you are sure. Hi sandy I’m wondering if I can use the leftover ham hok from thanksgiving? Also I’ve read through all the comments and now I’m so confused about which beans would work best lol! And when you say soak the beans how is that done exactly? I think you could, especially if it’s a meaty one! As for the beans, soak them at least 2 hours, using the navy beans or great northern. BEST SOUP EVER!!! I followed your recipe exactly as it was written. I used canned navy beans and leftover Trader Joe’s ham and hock. I am so disappointed that I was full after one bowl. The only changes that I made was that I added rosemary to the ip, and I also dashed red wine vinegar in my soup bowl. My bff and husband couldn’t stop talking about it! The Trader Joe’s ham was a difference maker!. Thank you for this recipe!!!! Kelly, I love TJ’s everything! I haven’t tried their ham yet, but I will! So happy you and your hubby liked this soup! This soup is the best. I used our semi frozen ham bone left over from Easter and non-soaked navy beans, cooked it for 50 minutes. This is the best bean soup recipe ever!!! It’s perfect! Thanks so much for the recipe. We’ll be using it again. Thank you, Christine! I’m glad you liked it! This recipe is fabulous! I just threw everything in the IP for 45 minutes – except for the carrots and celery which I steamed firm and added after the soup was finished – I refrigerated soup to blend the flavors and reheated later. This is the only ham and bean recipe I need! Thank for sharing! Thank you, Judy! I’m glad you liked it! God knows I’m blin d; however, what is the price of your ebook? I’ve made this soup twice and both times, it has turned out perfectly! Thanks for a great recipe! I followed it to the letter. 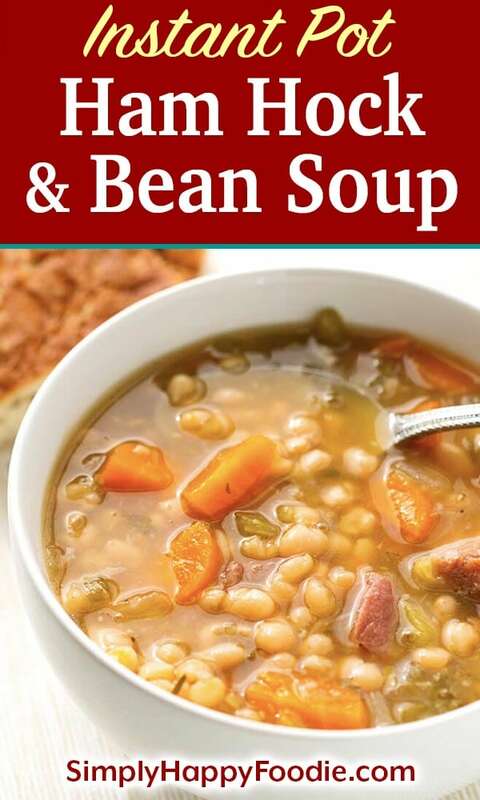 If you are looking for a great ham and bean soup recipe, look no further. This is as good as it gets. Thank you so much, Nancy! I’m glad you liked it! Can I use smoked ham slice with a bone in it? If so, do I cube the ham? You can, and I would cube the ham after cooking. Just pull it out and let it cool a few minutes so you can handle it. Then cube it and add back in. If I soak the beans for two hours do i still use the same amount of water in the Insta pot? Yes, just follow the recipe as I took that into consideration. I usually make ham and bean soup around the holidays but I’ve always made it on the stove, soaking the beans first, and my beans were always somewhat underdone. I finally got an InstantPot, and started looking for a ham and bean soup recipe, and liked the look of this one. I thought it came out great! The flavor was excellent, and the beans were done nicely. I used a bag of mixed beans instead of just navy beans. Hi Mary Ann, I’m glad this recipe worked well for you! Thank you for your review! Can’t wait to try this. If I soak the beans in my instant pot beforehand, do I just add the rest of the ingredients after two hours or do i adjust the liquid to make sure there’s still 6 cups. You can, though I prefer to add fresh water. I would like to try your recipe; as my sister has taken a bad tumble; and isn’t healing very well; I would like to make her some soup for easy meals for her! Can this soup be easily frozen and taken out when she needs a quick meal? Hi Lynnette, I’m so sorry to hear about your sister. She’s lucky to have you to help her! This soup can be frozen and it heats up very well. You might want to make her some bone broth and add it to other dishes that require broth, or she can drink it by the mugful. It is so good! This was a huge hit! I doubled the recipe and cooked it for approximately 1 hr 15 min. Super yummy!!!! My family (and guests) have requested I make it again soon!! Thanks so much for a simple and delicious recipe!! Can’t wait to try more of your dishes!! This is V-E-R-Y VERY GOOD! My hubby’s an old farm raised kid and he knows good beans. He declared this his NEW FAVORITE BEANS ON EARTH. We won’t let my mom hear that!… LOL. The only things I changed was after the cooking & NPR times were up I put the IP on sauté’ (low – uncovered) for about 20 min to cook it down just a little. I then put 1 pkg of “Nature’s Earthly Choice SEVEN GRAIN organic grain blend” into it. I would imagine this will freeze well too! However… there is NONE LEFT to freeze. Hi Felicia! I’m so happy to know that your hubby and you like this soup so much! My mom would have loved knowing this. Thank you for your review! That is so nice! Thank you. If you ever have questions please ask! Hi – I have pork hocks but they are not smoked. Should I add some liquid smoke? How much & when? Or do you have another suggestion? Hi Heather, Yes, I would start with 1/2 tsp of the liquid smoke and see how you like it. You can add more if you want. I followed the recipe but for some reason it tasted off. I can’t figure out what I did wrong or what I don’t like about it. It has an unpleasant odor and smell. I made a creamy tortellini soup that had the same smell and taste in my slow cooker. Any ideas on what could be causing this? I have no idea. Could it be the dried thyme? Not everyone likes it. The ham hocks have a smoked meat smell, maybe that? How did it taste?